When I started on this journey, the one product for which I had the most concerns about finding suitable alternatives was deodorant. While I’m trying to remove as many chemicals as possible from my products, I’m not quite ready to start rubbing crystals on my arm pits yet. I also live in Brisbane – Australia – which has a sub-tropical climate. So basically fairly mild (quite pleasant) temperatures from about May to August, and then humid, sticky and damned HOT, HOT, HOT for most of the rest of the year. Finding a cruelty-free and ‘as natural as possible’ alternative to anti-perspirant that could cope was not going to be easy. The ‘first cab off the ranks’ in my search has been Fresh Cream Deodorant from the MooGoo range, which I purchased from a local chemist here in Brisbane for $8.50. I love the packaging – I think the whole MooGoo brand is super cute – but I am especially drawn by the brand promise. MooGoo uses natural ingredients that are safe for both outside and inside the body. The Fresh Cream Deodorant is also aluminum free. According to the product information, traditional aluminium anti-perspirants work by using Aluminium to cause the cells in our arm pits to swell and block the sweat glands. Sweat itself is actually odourless and it is the bacteria that actually smells, so in the Fresh Cream Deodorant they have used natural ingredients to control the odour and therefore also the smell. Simple but clever – huh! Ok – so down to the testing. The first thing I noticed about the product was the smell. It has a lovely fresh lemony smell, but is not overpowering. The second is that it is very gentle and I have certainly noticed that even after shaving there is no irritation under my arms. Despite their reassurances that all is good in the pit-hood, there have been a couple of times when I’ve thought things were getting a little on the whiffy side. On one very humid day I had another shower during the day to freshen up, and on another day at work I did resort to digging out an old can of anti-perspirant in my drawer to give myself a quick freshen up before I had to go into a meeting. The one thing I have found is that it works best when I make sure that the deodorant has fully dried on my underarms after applying. Much to my five year old’s amusement, the easiest way I’ve found to do this is to simply ‘blow dry’ my arm pits with the hair dryer on low. On the whole however I must say that I do really like this product. I would say that it is PERFECT for mild climates – I’m still a little nervous about how it will hold up as the Brisbane summer heats up. I’ll let you know how we go! 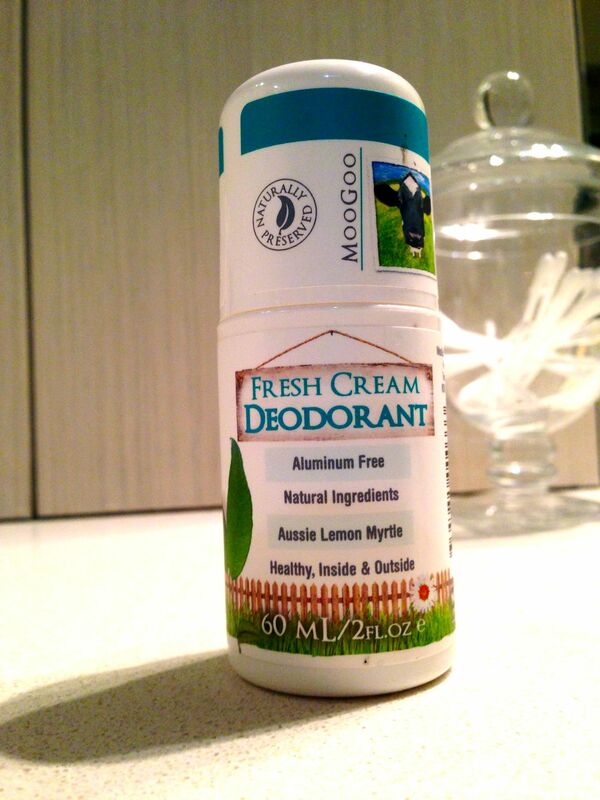 MooGoo Fresh Cream Deodorant can be found in chemists and natural health shops – or from the MooGoo website.